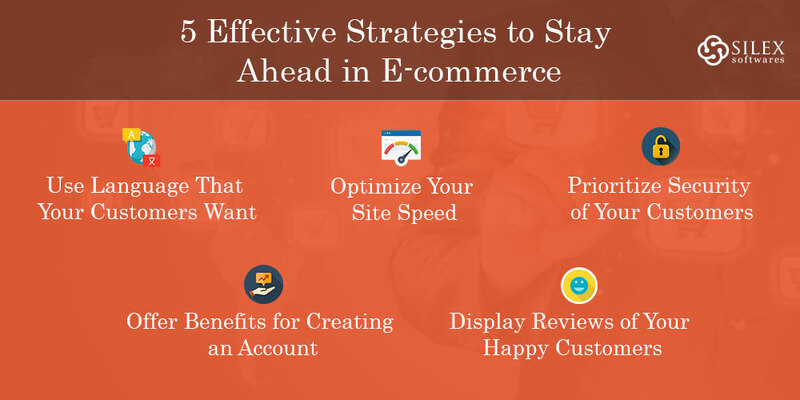 5 Effective Strategies to Stay Ahead in E-commerce - Silex Softwares Pvt. Ltd. If a website page is not loading quickly, it irritates users and convinces them to abandon a page. No matter how good your site or products are if your site is not good at loading you may lose many potential customers. Thus, the foremost factor that needs your consideration to stay ahead in E-commerce is the speed optimization of your website. Making use of only English version can impact in the growth of your site. Try adding different language options and respond to your users in their native languages. This will not only add value amongst users of your site but also give your users a feel to be at home. Moreover, if your site sells products keeping specific cultures and ethnicities in mind, using different languages can prove to be the best bet. Use this tip as a strategy and get benefitted in a big way. Customers visiting your site may feel hesitated to create an account, but if they are offered with some benefits they happily will do it. You can provide your visitors with some immediate benefit for creating an account on your site. It may be a discount in their current order or some gift hamper for becoming a reliable user. This one- time deal will surely convince your visitors to invest their faith in your products and services for the long term. Security is the utmost factor your customers would expect while purchasing a product. And if you are weak in that end, it may easily hamper your sale and number of customers. Consequently, earn the faith your customers by proving that your site is having great security and assure them that all their transactions on your site are going to be completely safe. This is another best option to stay ahead from the competition. Customers easily rely on testimonials mentioned by other customers. Hence, try adding as many reviews of your happy customers as you can for all your products. Apart from that, it would be really beneficial if you can add star rating given by your customers for a particular product. To make positive feed up, almost each and every social media, including Facebook, Instagram, and Tumblr gives you an option for the same. Taking all things considered, we hope that the aforementioned tips will help you boost your E-commerce site and take it to the next level. In an attempt to be at the top of the market, there are many other ways. Silex Softwares can help you to quickly and easily outrank your competition. Give our services a shot now and be the master of your domain.